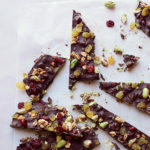 Chocolate Bark Topping – A super easy recipe to create really thin slices of chocolate that you can use as a topping for cakes or slices, or just eat it as it comes! – cacao butter melted, melted coconut oil, maple syrup/ agave syrup, cacao powder, pinch of salt, vanilla bean powder, Melt cacao butter and coconut oil in a double boiler. Add maple syrup, cacao powder, salt and vanilla and whisk gently to combine. ; Cool chocolate by placing bowl in ice and stirring for a couple of minutes- you should get a soft ‘ball-like’ piece of chocolate forming. ; Place the mixture between two sheets of baking paper, and use a rolling pin to roll it out very thinly. if you want to add toppings to the bark (or leave it plain0- use granola, bee pollen, goji berries, seeds, etc. Allow to cool in the fridge for 5 minutes. Then take it out, score the chocolate with lines to cut it to the size you want, and then allow to cool completely at room temperature. N.B. If you are pushed for time you can put it back in the fridge. ; When the chocolate has set, use the scored lines to break it up. I find it is always useful to have some of this in the fridge as it is a very versatile topping and lasts for ages. You can also eat it if the chocolate munchies strike! A super easy recipe to create really thin slices of chocolate that you can use as a topping for cakes or slices, or just eat it as it comes! Melt cacao butter and coconut oil in a double boiler. Add maple syrup, cacao powder, salt and vanilla and whisk gently to combine. Cool chocolate by placing bowl in ice and stirring for a couple of minutes- you should get a soft 'ball-like' piece of chocolate forming. Place the mixture between two sheets of baking paper, and use a rolling pin to roll it out very thinly. if you want to add toppings to the bark (or leave it plain0- use granola, bee pollen, goji berries, seeds, etc. Allow to cool in the fridge for 5 minutes. Then take it out, score the chocolate with lines to cut it to the size you want, and then allow to cool completely at room temperature. N.B. If you are pushed for time you can put it back in the fridge. When the chocolate has set, use the scored lines to break it up. Use this ‘bark’ to sprinkle over the top of cakes or desserts.